On the Eastern Shore of Maryland, waterfowl season arrives in a "big way," said Maryland native Steve Kline. The colder it gets up north, the more compelled the birds are to migrate south to the Chesapeake Bay, and come November, it's time to don the hunter's orange and hit the fields. First come the wood ducks, then the green-winged and blue-winged teal. And then there are the Canada geese. The place Kline calls home, Chestertown, calls itself the goose capital of the East. "Stories get passed down, like myths, that the geese used to cover the sky," he said. Traditionally, the week before Thanksgiving was when waterfowl hunters would hit the fields and get their first taste of the season. "I know a lot of guys who don't go out that week anymore," he said. "Lots of people are advocating for a later season because we're not getting our birds." An occasional series on the impact that warming temperatures are having on some of the world's most popular sports. Click here to read the other stories in the series. And for the last few years, Kline said, more geese have been bagged in Pennsylvania than Maryland. "That's an astounding development," he added. Kline began hunting the way most people do: He grew up with it. Twenty-five years ago, the Maryland native began going out with his father, hunting deer and small game. These days, Kline prefers waterfowl hunting for its social aspects, the chance for him to "sit in a duck blind with three or four buddies and share jokes" or "see the sun come up over the Chester River." Just about everyone agrees that the last few years have been challenging for waterfowl hunters, he said, although the reasons hunters themselves give for this aren't as clear. "I could point you to a million different forums online where hunters are complaining about the season and how hunting is terrible," he said, adding that they blame the changes on the state entities that set the hunting seasons. Standing apart from conspiracy theories, Kline says there's only one thing that can alter the migratory urges these birds have responded to for thousands of years -- a changing climate. "At the end of the day, it's changing weather patterns," he said. "Winters around here are not as cold as they used to be." In a 2008 report titled "Seasons' End: Global Warming's Threat to Hunting and Fishing," commissioned by eight of the nation's top sportsmen's organizations and put together by the Bipartisan Policy Center, Steve Williams, president of the sporting group Wildlife Management Institute, wrote, "A controversial, yet real, global climate trend threatens to disrupt generations of plant and animals adaptations." The ways in which climate change has affected and is already affecting the sport are numerous. Big game are migrating; changes in precipitation affect both saltwater and freshwater fisheries; wetlands are being lost, which affects waterfowl productivity; and warmer temperatures mean changes in invasive species, diseases and parasites. Williams continues, "If fishing or hunting exists in the lifetime of our children and theirs, it may take on an entirely new face." A family portrait. 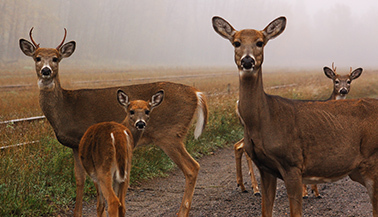 In the future, white-tailed deer will have more to worry about than hunters. Photo by Jeremiah John McBride, courtesy of Flickr. And yet there is a disconnect between what hunters see on the ground and what they choose to admit is the cause of those changes. For many, when the words "climate change" are tossed around, it becomes a taboo subject. This year, a cold November provided hope that this season would be better than the last in Maryland. Then, Kline said, it warmed up. "Christmas was a warm day," he said. "But hunters don't know if they can quite pin the tail on the climate change, and hunters who are thinking that are probably keeping that to themselves." In a way, that very breakdown threatens the conservation of the land sportsmen and women use because of the way conservation work is funded in the United States -- hunters and anglers pay excise taxes on gear and licenses that subsidize the protection of public land and species for the enjoyment of all. That method is called the North American model of wildlife conservation, and the idea is that all of the fish and wildlife on the continent are to be available for enjoyment by all citizens, and those resources should be managed such that they are available at the best population levels forever. Sportsmen subsidize much of that work. Hunting is not a cheap hobby to have. Between the hunting license, stamps to hunt certain species with certain gear, membership in conservation organizations, guns, ammo and clothing, it can quickly add up. If you want to increase your odds, decrease the competition a bit, you might then pay for access to private land. If you wanted to rent a duck blind or a goose pit, Kline said, you might add in another $5,000 a year. "As much as it costs, it's still in your blood to want to do it," he said, but added that a few bad seasons can have a chilling effect on the sport. Mark Taylor, a Virginian hunter with a passion for hunting deer, points to another problem with trying to sell climate change to hunters -- it happens too slowly. "Weather is one of the most critical variables for hunters," he said. "We pay attention to it as a 'what's happening right here and now.' If we took a long-term view of this, people might see, but that's just not what we do." He said old-timers who have kept detailed notes could probably see the connection, but "it's not happening in the scheme of things for the guy out there sitting in his deer stand." If someone could make the connection between bad hunting seasons -- when the birds come late or not at all, or the deer are dying because of outbreaks of epizootic hemorrhagic disease (EHD) -- that would get hunters' attention, both Kline and Taylor said. Taylor said white-tailed deer populations are doing just fine, although in Virginia, some populations have experienced large outbreaks of EHD, characterized by feverish deer often lying in water to cool their temperatures and marked by extensive hemorrhages. The disease is spread by the bite of midges, tiny flies that like dry conditions. With climate change, there will be more dry conditions. "I know a lot of people who put a lot of effort into managing their property to do the right thing for the wildlife because they enjoy hunting, and then they get an outbreak of EHD," he said. "If someone could make that connection [that it is related to climate change], that would get hunters' attention." This year, for example, Taylor said, the talk of the community was the dismal season. In some counties, deer populations were down 40 percent, but connecting those changes to climate change for a conservative constituency -- now, that's a challenge. About three years ago, Montana sportsman and fly-fishing guide Todd Tanner decided to transition from writing about the outdoors, and more and more about climate change, to working full-time to take what he and other sportsmen are seeing out in the wilderness and connect that to what the science says about climate change. In doing so, Tanner often has to confront a group of people who have deeply held conservative beliefs. "We go to our community and see what they say, and then most of us come down in line with this. If you're a conservative, you'll go to conservative news and you'll hear climate change is not real, not our fault, or real, but not as bad as you've been told," he said. "Unfortunately, that's wrong. This is the biggest thing we face." In Montana, Tanner has fished in 60-degree-Fahrenheit weather in February and has seen mountains barely get a dusting of snow and forest fires rage out of control. Everything he loves about hunting and fishing is changing. Because the snowpack melts earlier, the rivers are lower in the summer, which is not good for fishing, he said. Snowfall in October used to push the elk and deer from the mountains, and that would make for great hunting, but those things are memories from the past. "The one overarching issue is climate change," Tanner said. "Sportsman everywhere will be impacted." His group, Conservation Hawks, has set out to explain the science and communicate that climate change is responsible for the changes they are seeing and that these changes don't just jeopardize their seasons but will affect their children and grandchildren. Aside from getting hunters to have frank conversations among themselves about climate change (that will hopefully translate to conversations with their politicians), Tanner said getting hunters and anglers on board is important because it's their dollars that are paying for wildlife management. "Everything we do with fisheries and wildlife management is based on how can we protect these species and landscapes for future generations," he said. "And for partisan reasons, we're ignoring the science on the issue." There are five primary spots in North America that are crucial for waterfowl breeding and wintering. One of those areas is the Gulf Coastal Prairie, wetlands that provide habitat for 13.7 million wintering ducks and 1.5 million geese. The marshes that stretch along the Gulf of Mexico were once among the most productive wetland systems in North America, but human development, including the damming of the Mississippi River, has compromised the habitat. Sea-level rise, driven by climate change, is expected to cause the loss of 402,000 acres of coastline over the next 50 years in Louisiana alone. It's Tom Moorman's job to oversee conservation of that habitat. The director of operations for Ducks Unlimited's Southern Region, Moorman is tasked with using science and the North American model of wildlife conservation -- two core principles of DU's conservation programs -- to make investments that protect this habitat. DU calls itself "the world's largest and most effective private waterfowl and wetlands conservation organization" and has hundreds of thousands of volunteers around North America and millions of dollars to put toward conservation. You can't do that without understanding climate variability and how that may be changing, Moorman said. "If you're going to make these fairly expensive investments in habitat, you would like to make those investments knowing how relatively robust they are if climate throws you a curveball," he said. North America has been in what Moorman calls a "very, very wet cycle" for nearly 20 years, and as a result, waterfowl populations are at historic highs, but if that switches and the continent enters an equivalent period of drought, it could see record lows. "It won't happen overnight, but we have to communicate that variability to hunters," he said. Moorman said protecting the wetlands can help them serve as a buffer against climate change. "If you keep the capacity of those landscapes in fairly good shape, you can endure drought, and when the water comes back, the birds will come back in time," he said. The passion hunters feel for the sport is fierce, and often, they have a lot of hope that things will bounce back. "If a guy is told, 'Hey, you're not going to be able to hunt white-tailed deer unless you buy a hybrid car,' they'll trade in their [Ford] F-250," Taylor said. "That's how passionate they are." And if just a fraction of the more than 12 million hunters begin talking about climate change, it could create a space for their representatives to do the same. Kline said hopes hunters, aided by businesses that provide goods and services in the $90 billion sporting industry, can begin to open up. "Things need to change," he said. "I've got an 18-month-old boy, and recently a flock of geese flew over and he pointed at them. So I think in his heart, he's a hunter, and I want him to be able to do this and do it better than me."